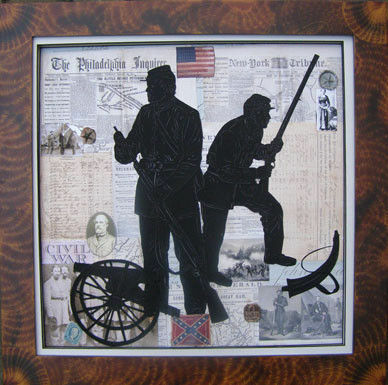 Civil War Silhouette Collage Hand cut soldiers, cannon & powder horn w/ prints of antique news paper headlines & battle maps, battle prints, wax seals, flags, cw photos. Framed in hand made Vinegar Grained, Poplar wood frame, made in USA. Prints not available yet.